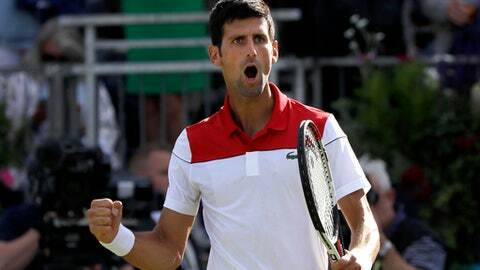 LONDON (AP) Novak Djokovic eased past second-seeded Grigor Dimitrov at Queen’s Club with a 6-4, 6-1 win on Thursday. Former top-ranked Djokovic, who accepted a wild card into the Wimbledon warmup tournament, had little trouble against the 2014 champion and advanced to the quarterfinals. Djokovic won the last of his 12 Grand Slam trophies at the French Open in 2016 and has battled motivation and injury issues, but he looks confident ahead of next month’s Wimbledon. Earlier, Nick Kyrgios sent down 32 aces as the Australian followed up his win over Andy Murray by beating seventh-seeded Kyle Edmund 7-6 (3), 6-7 (5), 6-3. Kyrgios ruined Murray’s long-awaited comeback on Tuesday and then sent the current British No. 1 out of the second round. Kyrgios faced only one break point as he moved into the quarterfinals.